The Pilates Reformer was created by Joseph Pilates. You can lie, kneel, stand or sit as you use your body to glide on the carriage by pulling the straps or push on the foot bar. Many reformer exercises are done when lying flat, hence the headrest (which can be adjusted) while the shoulder blocks keep your body stable as you move the carriage. Your feet, hands or knees can also use the blocks. The foot bar allows you to move your body while on the carriage and is adjustable. Springs provide the resistance, combined with your body weight. Again the springs are adjustable to vary the resistance. Adjusting the gears changes the tension of the springs. Machines vary, some will have ropes and some straps. Straps connect to pulleys at the top of the reformer and you use them to move your body on the carriage. Every student at Pilates Central is thoroughly taught on all the variations of using this impressive apparatus. 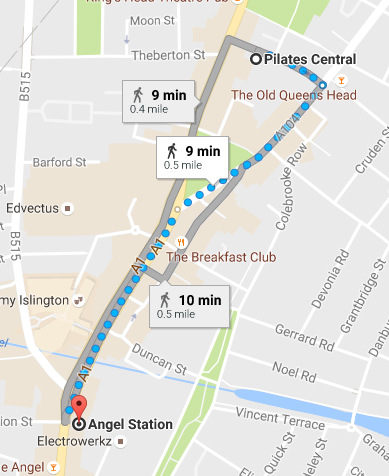 Pilates Central is a short walk and even shorter bus ride from the Angel tube station on Islington High Street. So if you’re looking for Pilates Reformer classes in Islington you’ve come to the right place! The Reformer machine can look intimidating to people who have not participated in a Reformer Pilates session before. Invented by the creator of Pilates, Joseph Pilates, it is a versatile piece of equipment. The Reformer enables the user to perform an extremely wide range of exercises designed to work the whole body. A Pilates Reformer looks like a couch or bed with a sliding platform that is attached to the Reformer’s frame by springs. The sliding platform is called a carriage and it moves up and down the frame on wheels. The springs are adjustable to increase or decrease tension, which provides more or less resistance when executing movements. In this respect, the Reformer can be altered to suit the user’s ability level. There is also a foot-bar and two ropes or straps. Exercises performed on the Reformer target both the large muscle groups and smaller accessory (supporting) muscles. The resistance created by the springs can be used to isolate specific muscle groups. The straps and foot-bar enable you to focus on small muscle groups, for example, in the arms, or to work out all the parts of the leg. The unique functions of the Reformer make this equipment suitable for a total body workout. The benefits of Pilates Reformer exercises are that not only can you work on your whole body, but your instructor can help you to focus on problem areas and use the Reformer to specifically target those. The Pilates Reformer also helps you to feel, and the instructor to observe, which parts of your body are stronger than others. This is useful for pinpointing specific areas that need to be worked upon. In a typical session the instructor will take the you through a series of repetitive exercises. The movements required are small and isolated. This is because they are targeting specific muscle groups without injuring or straining joints. Moves can be modified to take into account any current or previous injuries or health problems. As you learn each exercise, you will make minor adjustments and realign yourself, as instructed, in order to perform the exercise correctly and to your maximum potential. Over time, the exercises become easier and the movement becomes more fluid. Even after your first session, you should feel stretched with a more open posture. With more practice, you breathing should improve and your body will begin to tone up and become more flexible. Interested in a Pilates Reformer Course? To book your assessment and initial session, please fill in the contact form or call us.